After seeing some photos of places in the northwestern Chinese province of Gansu, I decided to push to the region. I’m glad that I did. Of my favourite things I saw in all of China, I think 4 of them were in this region. It really was worth the long haul to get out here. Over the past couple weeks I’ve seen the Zhangye Rainbow Mountains, the westernmost section of the Great Wall of China, and Mati Si, all of which were awesome. 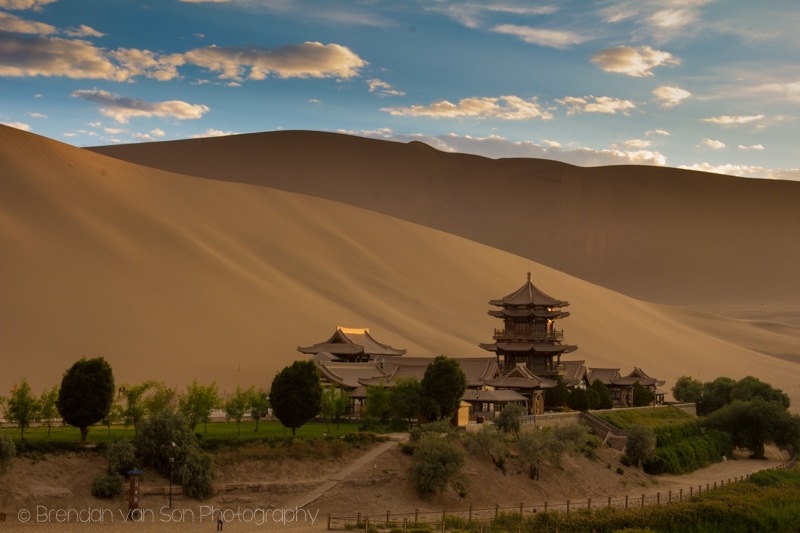 My final destination before making the long haul over to Mongolia was a piece of desert just outside of the town of Dunhuang and The Crescent Moon Oasis and Temple. This is unlike any section of desert I’ve seen in my life; and I’ve been to a lot of them. Basically, the dunes come out of nowhere. You’ve got flat farmlands throughout the region with a series of mountains that form a spine across it all. Then, these dunes just spring from the flats and into the sky. It’s pretty cool. 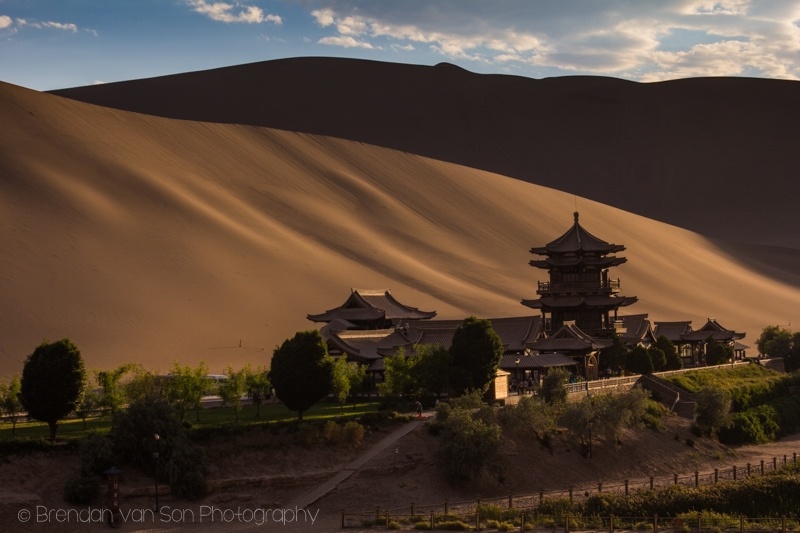 The area around the Oasis in Dunhuang is actually a protected park. And like most Chinese parks you can’t just wander through here, the vast majority of it is blocked off by fences meaning you need to pay entrance to visit the park, oasis and temple. In reality though, I think it’s a good thing. It helps maintain the natural region better this way. The cost of entry to the Oasis and dunes is 120 Yuan. The entrance fee doesn’t include any of the many extra activities available inside such as camel rides, ATV rides, etc. The ticket is also only valid for one day. If you can present a student’s card, the cost is 50% off. The park’s hours depend on sunrise and sunset. From what I understood, you could only visit the park at sunrise with a special tour. However, the park was open for sunset without a problem, as you can see in the video. There was no real set closing time, people just started funneling out once the sun set. There are some overnight excursions available in the park as well. Thus, the opening hours seem more like suggestions. A climb to the top of one of the dunes gives you this view. There are trains that leave from Jiayuguan to Dunhuang however the hours are insane. I think the three trains run at 1am, 2am, and 4am for the 4 hour journey. The return trip is much more sane. There are also 4 or 5 buses from Jiayuguan that take about 5 hours leaving from the central bus terminal. 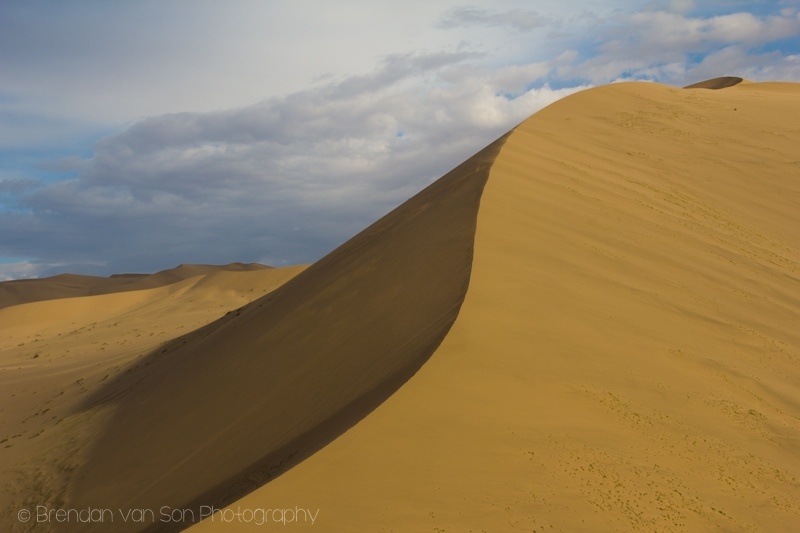 Once in Dunhuang, you’ll either be staying near the dunes or in town. 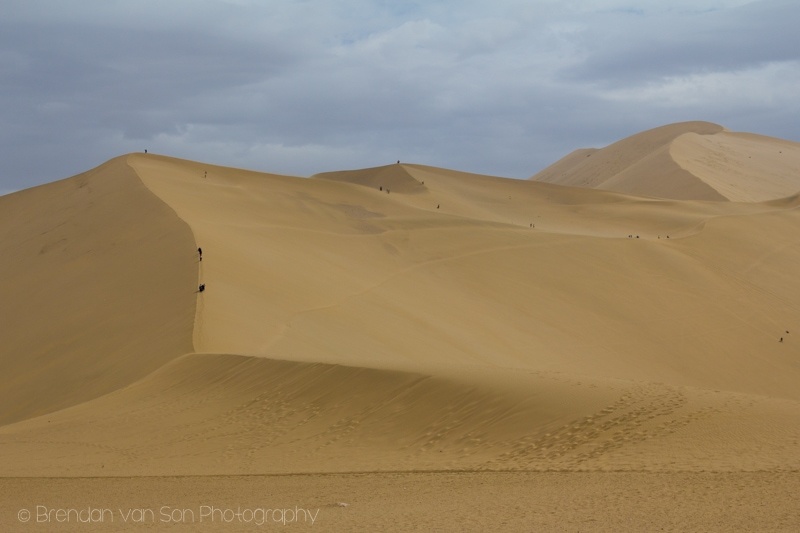 There are buses that run from town to the dunes constantly and cost 1 Yuan. Loved the contrast and lines to this scene. I shot this colour too, but it seemed like a cool idea to flip it Black and White. Just hanging out waiting for the light to turn. The light got really good for about 5-10 minutes. I think I made the most of it. You know the light is starting to get good in the desert when the shadows start forming on the dunes. Loved the light I was getting here. Just a nice bit of soft light hitting the dune behind the temple. How perfect is the light over this? 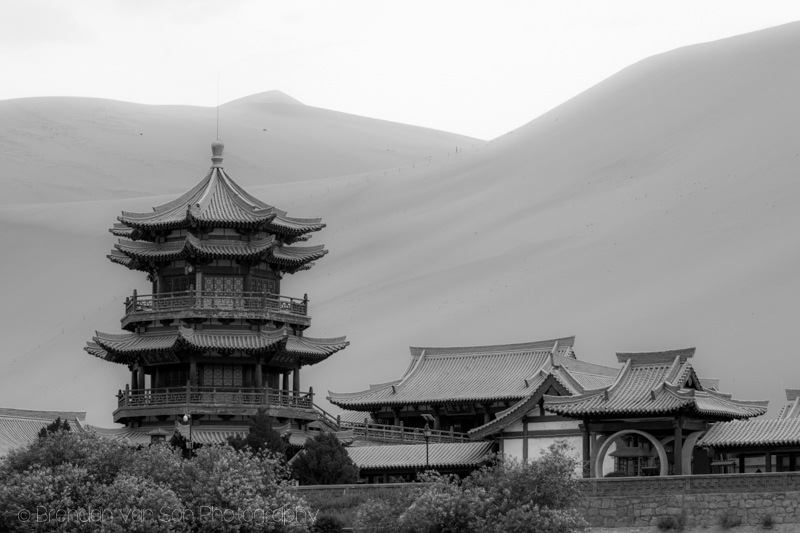 Had such a good time in Dunhuang. Are you sure this was not a mirage? This place looks super cool. I wonder for the sand dunes if they have snowboarding or skiing down them? I had a chance to snowboard in Dubai down some pretty cool sand dunes but these ones look a lot more extreme and fun though I may be afraid of a sand avalanche. Haha, yup. I’m 83% sure this wasn’t a mirage! Thanks for reading. And, yeah, there were a couple people sandboarding. I didn’t rent a board though. 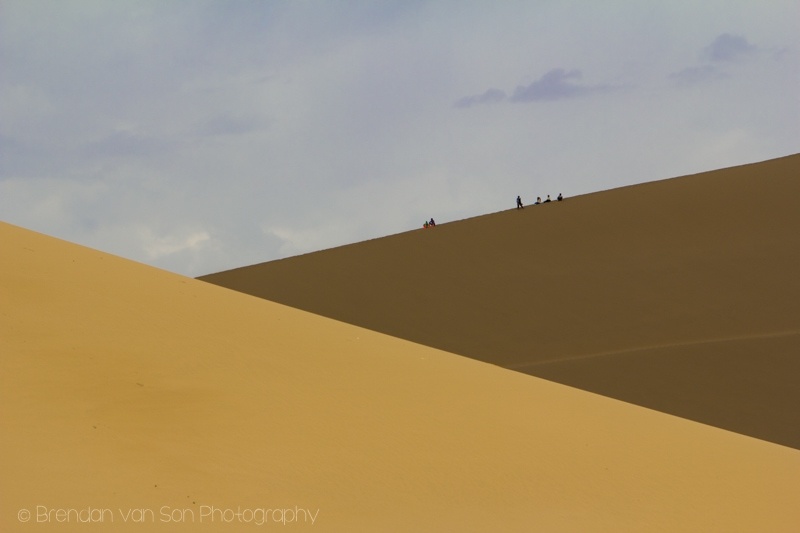 Too lazy to hike up and down the dunes. That is still 17% dude… lol But cool. I am going to put this on my list of places to go when I hit up china. These dunes and Oasis remind a lot of the dunes and Oasis we went to in Peru. Yup, I was saying the same thing. 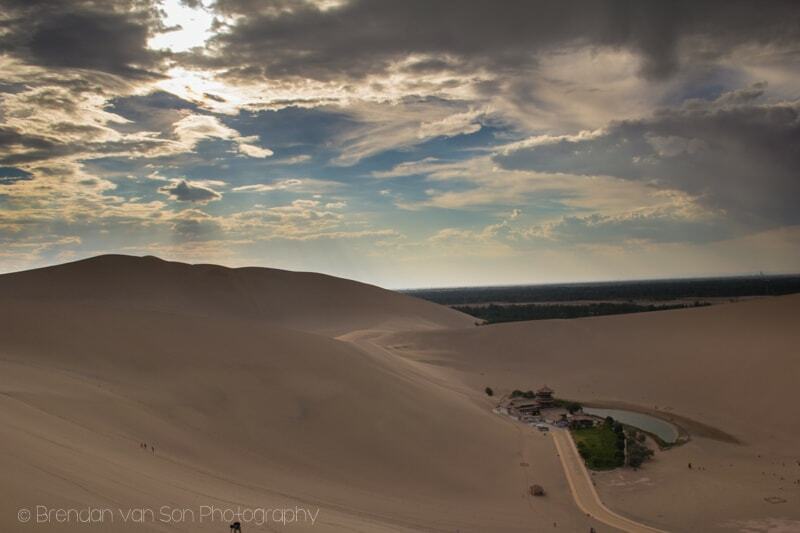 Fairly similar to Huacachina although the dunes in Peru are bigger and seem more vast. It looks so surreal! The dunes and the oasis photographically fantastic. wow!Icant blieve these photos be real..
Yup Mitra, I know it! I leave a lucky life. Dunhuang was really cool to see! You should hit up china Sarah, it’s awesome. A challenge, but really cool photos come out of it all and a great experience. 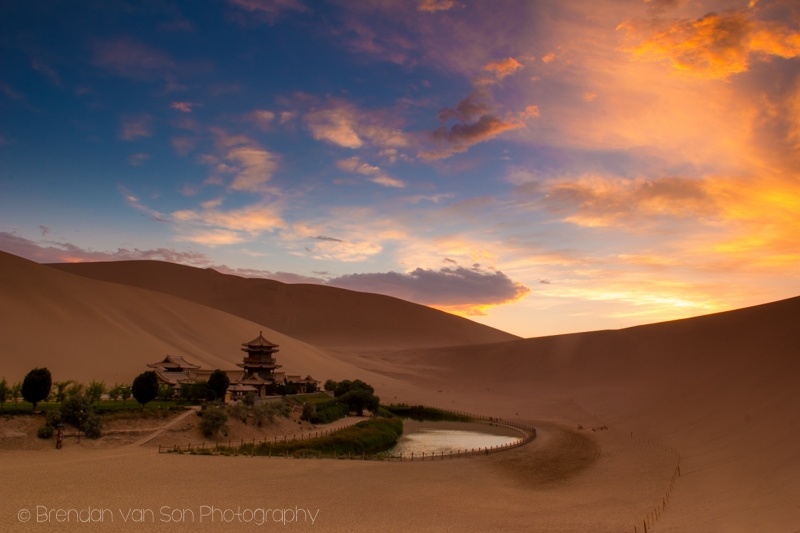 The Dunhuang Oasis is a must too, as you can see! 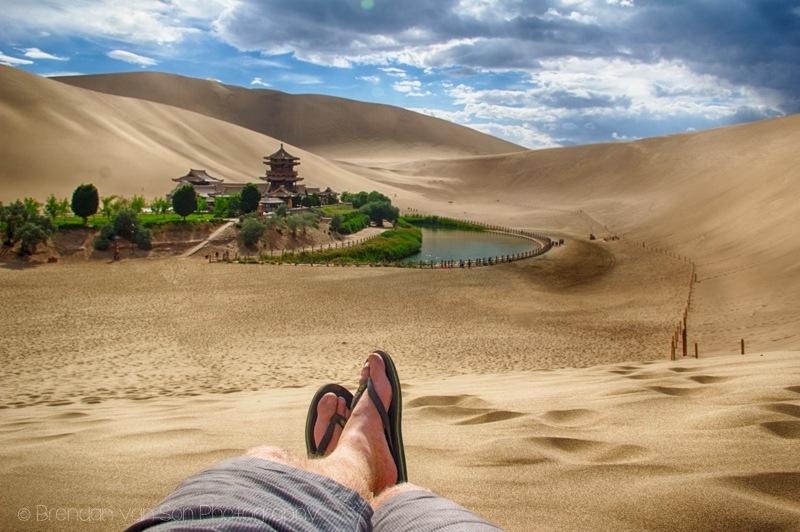 I had no idea China had deserts – this place is absolutely stunning! In my experience, deserts that emerge in unexpected places are often the most breathtaking. Thanks for a great post, Brendan – you are a wonderful photographer. Thanks for checking out the article Miriam. This place looks amazing, i would love to get the chance to visit. Thank you for your share my friend. Hi Brandon.. the pictures is so..so..AMAZING…!! I am completely obsessed with this place. I should be there next June. I cannot wait to see this. It’s an awesome place Jennifer, you’ll love it! Looks like a place that can not be neglected for the adventure travellers..who are in search of something new..